I’ve met a lot of people in the last week. A lot of people from a lot of different universities and countries. Countries such as Brazil, America, Canada, Belgium, France, Hungary, England, China, Jordan, Turkey, Russia, Ukraine, Poland, Sweden, Finland, Morocco, Egypt and more. All of these people are here in Reutlingen to do a semester or more of study abroad and some of them intend to do an internship semester here too. Why is this interesting? Well because no one in South Africa does it, well almost no one. I’m only the second South African who’s been here in the last few years, and me, like the previous South African, didn’t come here to study, but to do research or work on a master’s program. Almost everyone I’ve spoken to here is doing their first degree and was given the opportunity to do one of their semesters abroad. Speaking to these people, they aren’t the only ones from their class who are doing an exchange. Some of them have several friends here currently, while others have gone to other universities all over the world to do similar projects. 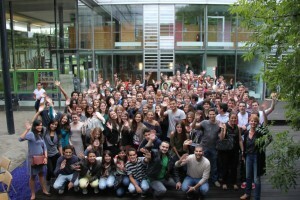 Reutlingen itself sends it’s students all over the world. Before coming to Germany, I met 3 students from here who are doing their internship at my home university NMMU. They were a group of over 10 students currently doing a semester at NMMU. Others have gone to Cape Town, Stellenbosch or other partnered universities around the world. Why then doesn’t this happen in South Africa. I don’t know of anyone of the of 400 engineering students that graduated their degree with me last year who spent any time studying abroad, whereas here and elsewhere it is the norm to do this. I know of quite a few master’s students from South Africa who have spent time overseas doing an internship or research at foreign universities or businesses, but no one at the degree level. Considering the large percentage of students that don’t do postgrad degrees, they never really get an opportunity to experience this. In Europe there are projects such as the Erasmus Programme which aims to help exchange students as well as build cooperation amongst EU universities. But there are non-EU countries still doing these exchange programs. There are difficulties, firstly the semesters in Europe tend to run from October-February and April-August, different to the February-June and July-November found in South Africa. Secondly ensuring the content covered by exchange universities matches that required for the issuing of a degree by the home university. But surely there must be ways around this? In any case, I’m thrilled to have the opportunity to be here and experience life here for the next 3 months. This entry was posted in germany 2012 and tagged erasmus, student exchange by Gareth. Bookmark the permalink. Im looking forward to going there, Reutlingen, for an exchange program.